Excel for Mac finally deserves real consideration as a spreadsheet tool, even on older computers. 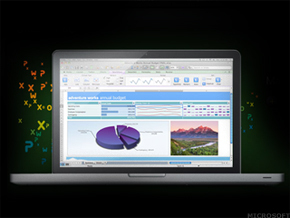 Microsoft Excel for Mac -- for business? Potentially, yes. As much as Microsoft ( MSFT - Get Report) and Apple ( AAPL - Get Report) hate to admit it, there is one place the bitter rivals openly cooperate: business process software. Microsoft's Office lineup of Word, PowerPoint and Excel running on Macs is probably the oldest and, by some measures, most successful software brand for both companies. Excel hit its 25-year anniversary in September. And with Apple's fortunes on the rise, the entire Office for Mac group has gained cache inside Redmond. To wit, the group just released its latest upgrade, Office 2011, which packs faster performance, new features and a long-overdue trip to the woodshed for Entourage, Office for Mac's ridiculous e-mail client. Microsoft Outlook, the standard communications platform for business, now works for Macs and PCs. I got an in-depth demo from Excel for Mac product manager Gavin Shearer, and I have been testing a final version for several weeks, focusing on Excel as a quant tool on the Mac. This is a legit version of Excel that really works on the Mac. No matter what Google's ( GOOG - Get Report) Spreadsheets, Apple's Numbers or Sun's OpenOffice claims, without question Microsoft Excel is still the king of spreadsheets. It is fast, unbelievably flexible and the backbone of just about any successful business I am aware off. Problem was, running Excel on the Mac was a royal pain. Spreadsheets often would not export properly, charts and formulas would go south and for some nutty reason performance was flat. Basically, if you needed Excel, you needed a PC. Look elsewhere for super-powerful processing, a user interface you know and low prices. This is still Microsoft, a big fat company with millions of lines of code and zillions of hours of history that must be accounted for when they make products. So there is some way goofy stuff here. Remarkably, this latest upgrade is still 32-bit code; If you need real processing horsepower -- that is, native, 64-bit solutions -- Office for Mac 2011 is not for you. Also, you will need to get right with Microsoft's Ribbon layout, which drives many old-school Excel heads over the edge. Yes, you will have to poke through the Ribbon interface to find your favorite functions. And no, you cannot strip down this code to look like the Windows XP version you love. And be ready to spend some money. The per-user business license fee is $199 for for the software, then say $2,000 or so for the Apple hardware you need. And if you want your group to collaborate, you face the flurry of pricey Microsoft Exchange and SharePoint server licences. So $3,000 a seat is not out of line. If you are upgrading your business infrastructure, give Excel for Mac the once-over. Microsoft deserves real credit here by finally letting you use it in both PC and Mac environments as a fast, robust work tool. Just be prepared to spend to get into the software and deal with a new version of the program you -- and I -- love. Jonathan Blum is an independent technology writer and analyst living in Westchester, N.Y. He has written for The Associated Press and Popular Science and appeared on Fox News and The WB.